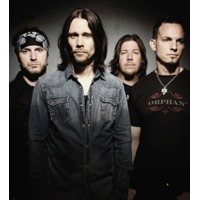 Alter Bridge is an American rock band that was formed in 2004 in Orlando, Florida by then-former Creed members, lead guitarist Mark Tremonti, bassist Brian Marshall, and drummer Scott Phillips. Lead vocalist and rhythm guitarist Myles Kennedy, formerly of The Mayfield Four and the current touring frontman of Slash's solo project, joined shortly afterward. The band is named after an actual bridge that used to be located in Detroit, Michigan near Tremonti's home on Alter Road. The bridge led to an unsafe area, and the neighborhood children, who saw the other side of the bridge as the "unknown," were forbidden to cross it. According to Tremonti, the name of the band symbolizes choice and looking to the future. Despite Creed's multi-platinum success, Alter Bridge arose with only gold status with their first album, One Day Remains, which was released in August 2004. It was followed by Blackbird in October 2007 and AB III in October 2010. Alter Bridge has had relatively low mainstream success in their home country of the United States for the majority of their career, although the individual band members are known for their involvement with many notable side projects, including solo and session work, Creed, and Kennedy's collaborations with Slash and former members of Led Zeppelin.